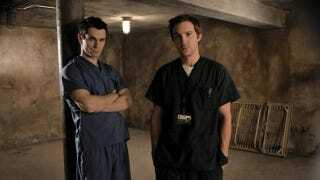 Being Human's Sam Witwer and Sam Huntington are live on io9, and taking your questions! Last night the new season of Being Human premiered on Syfy. And to celebrate, we've got Sam Huntington and Sam Witwer (The Wolf and The Vampire) live and taking your questions for one hour only, starting at 5:00 EST. So get to asking! Warning: there may be discussion of spoilers about last night's premiere. Before Sam Huntington was a werewolf, he appeared as classic comic book character Jimmy Olsen in Superman Returns,and in a run of other genre fan staples including Fanboys (perhaps this was where the season 2 Jay Baruchel cameo came from), Detroit Rock City, Warehouse 13, Veronica Mars and a whole lot more. Sam Witwer has been in almost every important genre thing, ever. You may remember him as Crashdown in Battlestar Galactica, Starkiller in The Force Unleashed, Doomsday in Smallville — and he's currently moonlighting as the voice of Darth Maul in Clone Wars. Witwer even had a small undead role in The Walking Dead. This is the third season of Being Human and already things are changing big time in this supernatural soap. Sally is a whole new creature. Josh killed someone with his own two hands. And Aidan has a whole new hairdo (and a beard!). Get excited people. At 5:00 EST, Witwer and Huntington will sign on and tackle as many questions as they can. You know the rules — they've volunteered to drop by the io9 house, so be polite! And please check to make sure your question hasn't been asked already. UPDATE: Aaaand that's a wrap. They may return to answer a few more questions in the future so check back later on down the road. Thank you Sammy! Thank you Sam!